This simple ribbed scarf is exclusive to LoveKnitting and designed by the wonderful Sarah Hatton. Read on to find out more about this and the gorgeous cardigan collection now available to LoveKnitting customers. Sarah Hatton has done it again – this time with a simple yet infinitely wearable scarf worked up in the fabulously soft Rowan Brushed Fleece. It’s the perfect project to knit quickly to keep you or your loved ones toasty warm in the cold months ahead in the Northern Hemisphere. Sarah now also has a range of stunning cardigans and shrugs available to buy on LoveKnitting. Clemence, Colette, Every Which Way, Miette, Maura and Hettie strongly reflect Sarah’s signature design style. Each is worked in one colour using clever shaping, design and texture to create a beautiful and flattering garment. To shop all of these designs, browse Sarah Hatton’s patterns here. Watch this space for more stunning patterns from Sarah in the coming months! Sarah’s scarf is designed with Rowan Brushed Fleece in mind. It is a warm, super soft blend of extra fine merino wool and baby alpaca available in 12 beautifully rich marl shades. Perfect for cosy winter knits, Brushed Fleece knits up quickly on 6mm needles and although a chunky yarn, is very lightweight to wear. Sarah’s scarf is photographed in a sophisticated grey, Crag. 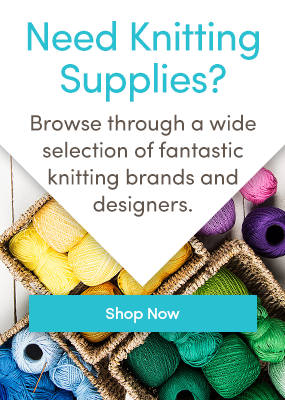 How to download the pattern: Click on the image above to download the free pattern – this requires you to create an account with LoveKnitting. If you’ve already shopped with us, then you will already have an account and can simply sign in. Many of you may receive our newsletter but have not yet created an account on our site. It only takes a few moments and once you have your free account, you can access all patterns that you download in your very own library! Learn more here. Sarah Hatton models her own Every Which Way design. The versatile pattern can be worn as a scarf, poncho, waistcoat, shrug and cape all by fastening the attached buttons in different ways. I didn’t know that Sarah Hatton had a website. How exciting! She has “saved” me twice when I had problems when knitting and so will certainly support anything she does!